I am the founder and president of SMILES CHARITY that began as a skating party for my patients in 1999. Patients would bring a $5 donation to skate and have pizza. With our dental colleagues we would raise $5-10,000 a year to donate to build homes for deserving families. Our dream however, was to fund an entire home. So in 2008, we were able to organize an outdoor concert over Memorial Day Weekend in the green space behind my new Adriatica office that could accommodate 20,000 fans. Generous individual and corporate sponsors donated to raise funds to help build the homes. 6,000 people attended the first year and were entertained by local favorite the Maylee Thomas Band and country artist Chris Cagle. In 2010 one of my first patients was killed in Afghanistan while serving our country a week shy of his 21st birthday. Ever since then, SMILES CHARITY has been building homes for wounded veterans. Our event features a children’s area and local food vendors. A flyover of WWII airplanes always brings cheers from the crowd. Up to 3 bands provide 5 hours of music. We’ve had Gavin DeGraw, Uncle Kracker, Little Big Town - before they hit the big time - and Andy Grammer to name just a few. The finale fireworks show is a crowd pleaser. Every year on Memorial Day weekend, we’ll have about 15,000 fans in attendance. It has been great to see how our charity has grown. SMILES CHARITY was even awarded Best Local Event by McKinney Online. I also sponsor several school sports teams that my patients are part of, and for over 20 years now I have awarded orthodontic scholarships to deserving student patients. During the holidays every year, we host an annual toy drive to benefit McKinney families. And I have donated treatment time to the Lost Boys of Sudan, here in Dallas. In 2013 I saw the need to help children with back-to-school shoes so I started the SHOES FOR SMILES program. Patients donate preowned shoes that are recycled to help buy the new shoes for deserving kids from the BOYS AND GIRLS CLUB OF COLLIN COUNTY. Over 500 new pairs of shoes have been given and over 1,000 preowned shoes have been donated. It’s such a joy to see the look on the kids’ faces as they wlk around in their new shoes! Sometimes it’s the little things like having pride in what you wear when you’re entering a new school year to help you have confidence to reach challenges. This wonderful community of McKinney is my home. It’s been a great place to raise a family, a welcoming place to have my business - and I want to say THANKS for the opportunity to serve the folks here - and give back some of the blessings I’ve been given. It is Back to School time which means shopping for new school clothes and supplies. Sadly many kids cannot afford these new items. Dr. Buchanan of Dr. Buchanan Orthodontics saw the need and 5 years ago started the Shoes for Smiles program. 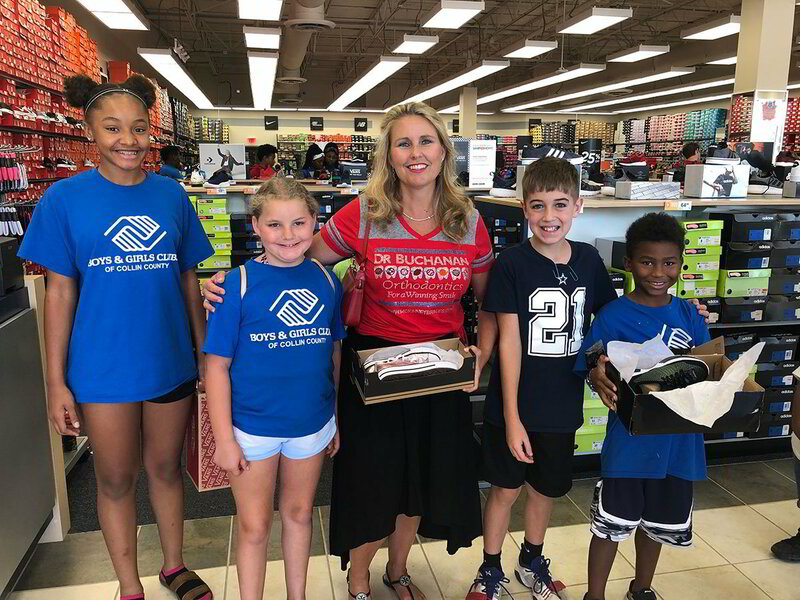 Dr. Buchanan‘s office and her patients donate preowned shoes that are recycled to help buy the new shoes for deserving kids from the Boys and Girls Club of Collin County. Over 500 new pairs of shoes have been given and over 1000 preowned shoes have been donated. “It is such a joy to see the look on the kids faces as they walk around in their new shoes.“ states Dr. Buchanan. To quote one child, “ I thought I was a size 8 but I am excited I am growing! I now wear a size 9! As he runs down the aisle at the shoe store he exclaims “Look how fast I am! !” Another child stated,“ I have been asking my Mom for these shoes for a long time! Thank you so much!” Dr. Buchanan adds,”Giving these kids confidence and also functional shoes to start school is important so they can be successful. Sometimes it’s the little things like having pride in what you wear when you’re entering a new school year to help you have confidence to reach challenges. Also having a proper fitting athletic shoes can enable these children to participate in athletic events at school. For more information please contact Dr. Buchanan’s orthodontic office at 972-542-4412 or at www.mckinneybraces.com.